How much does it cost to travel to Siofok? How much money will you need in Siofok? Ft12,856 ($45) is the average daily price for traveling in Siofok. The average price of food for one day is Ft4,857 ($17). The average price of a hotel for a couple is Ft12,000 ($42). Additional pricing is in the table below. These average travel prices have been collected from other travelers to help you plan your own travel budget. 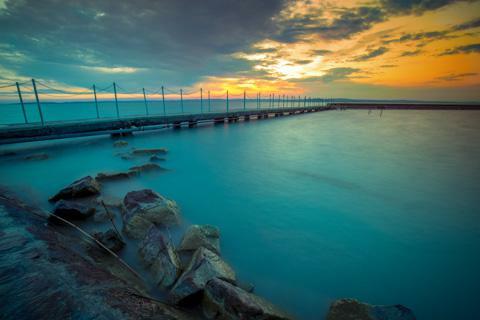 Siofok is a charming lakefront town located on the southern coast of Lake Balaton in Hungary. It is one of the most popular holiday resorts in the nation, drawing at least two hundred thousand visitors each summer for its peaceful beaches and thriving nightlife. While lakefront beaches and the accompanying resorts are the main attractions, Siofok also has a host of other opportunities for sight-seeing, dining, shopping, and entertainment. Most people visiting Siofok come to the town on vacation, looking to spend their time beachside. There are plenty of resort areas which offer accommodations and activities right on the water, as well as free access beaches which are open to the public and located away from the bustle of the more popular areas. Other sights beyond the beaches are located inland. The water tower is one such landmark, centrally located at Szabadsag square and standing at 45 meters tall. Built in 1912, visitors can climb most of the tower. There is also a tourism office located at its base. Another historic structure is the Visitation of Our Lady Church, one of the oldest buildings in town built in neo-Roman style in 1903. It is a work of art, ornately designed architecturally as well as with its interior paintings, stained glass windows, and the largest organ of the Balaton region. There is also a Lutheran Church which is another impressive building. A few additional attractions include the Emmerich Kalman Memorial Home, a mineral museum, the Sio canal, the Villa Jokai, and a beautiful rose garden. The two main resort areas of Siofok are Aranypart (Gold Shore) to the east of the Sio Canal, and Ezustpart (Silver Shore) to the west. Both have plenty of accommodations as well as easy access to beaches, dining, shopping, and entertainment. Most amenities are concentrated in the areas along the waterfront for the convenience of the summertime wave of vacationers. Some of the lakeside resorts provide activities for their guests, like Beach Club or Coke Club, which organizes beach volleyball games and tournaments, has a swimming pool, streetball court, tennis, ping-pong, water polo and volleyball in shallow water, live concerts on a main stage, exercise shows on the main sandy beach, bars, restaurants, and dancefloors all around the resort. At night, the same resorts come to life with a party scene that involves all the merriment of vacation. Many establishments will also feature live music. There are also free access beaches which tend to be less crowded and quieter. They are pretty easy to find, located just about anywhere along the beachfront except for near the city center. Other activities in Siofok include things like swimming, sun bathing, boating, sailing, kite surfing, and wakeboarding. For boat rentals, visitors must go to Siofok Marina to the west from the main port. There is even a spa where visitors can soak in healing geothermal waters. On occasion, the Imre Kalman Cultural Centre (located next to the water tower) will host a range of events and activities as well. The venue is a space suitable for theater performance, cultural display, and conference organization as well as events like festivals, musical showcases, and exhibits of the fine arts. Cuisine of Hungary is primarily based on meats, seasonal vegetables, fruits, fresh bread, dairy products, and cheeses. Paprika is used generously in cooking and is considered the national spice. Goulash, a soup or stew of meat and vegetables and seasoned with paprika and other spices, is especially popular and common throughout Hungary. Other specialties include stuffed peppers, cabbage rolls, roasted meats, and casseroles, as well as a hot and spicy fish soup called halaszle, a chilled sour cherry soup called hideg meggyleves, and Hungarian crepes called palacsinta which can be stuffed with jam, cheese, raisins, or meat. Most restaurants in Siofok are concentrated along the waterfront, serving traditional Hungarian fare as well as international flavors like Italian or Asian. Hungary's main international airports are Budapest Ferenc Liszt International Airport in Budapest (formerly Budapest Ferihegy International Airport) and Airport Debrecen in Debrecen. Many people fly into Budapest which is about 140 kilometers from Siofok via the M7 and M0 motorways. An alternative is to ride the train, a journey which takes about an hour and a half. There is also a small international airport in Sarmellek, called Heviz Balaton Airport, which is about an hour drive from Siofok with flights arriving from many European cities, especially German cities like Berlin, Hamburg, Frankfurt, Düsseldorf, Erfurt, and Leipzig, but also from Moscow, Russia and Riga, Latvia.